One Mexican rancher has given up cattle for the sake of wildlife like the jaguar. Rancho El Aribabi owner Carlos Robles Elias welcomes the big cats–as well as animal tourists who want to see them and the coati, javelina, eagles and rare birds that roam the area. Rancho El Aribabi, a conservation ranch about 30 miles (45 minutes) south of Arizona in the Mexican state of Sonora, is a popular spot to watch birds (Montezuma Quail, eagles, hawks, egrets, the elf owl, hummingbirds, among others). Coatis live here, too. 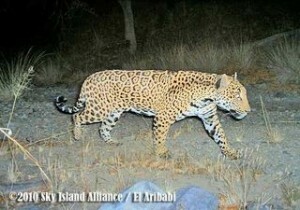 But the biggest excitement is the ranch’s work with the Sky Alliance to help save the jaguar. Photos of the big cat have been taken on the ranch. Over 35 threatened or endangered species of plants and animals live on the ranch. You can help support it by coming to visit. They have facilities and guest rooms for up to 12. Golden Eagle (Águila Real, Águila Dorada, Aquila chrysaetos). Yellow-billed Cuckoo (Cucú Pico Amarillo o Cuclillo Ala Rojiza, Coccyzus americanus ). Buff-collared Nightjar (Tapacaminos Préstame-Tu-Cuchillo, Caprimulgus ridgwayi). Elegant Trogon (Trogón Elegante, Trogon elegans ). Green Kingfisher (Martín Pescador Verde, Chloroceryle americana). Scissor-tailed Flycatcher (Tirano Tijereta Rosado, Tyrannus forficatus). Rose-throated Becard (Mosquero Cabezón Degollado, Pachyramphus aglaiae). Sinaloa Wren (Chivirín Sinaloense o Saltapared Sinaloense, Thryothorus sinaloa). Black-capped Gnatcatcher (Perlita Gorra Negra, Perlita Sinaloense, Polioptila nigriceps). Streak-backed Oriole (Oriol Dorso Rayado, Calandria Dorso Rayado, Bolsero Dorso Rayado, Icterus pustulatus). a.- Weekend, two nights (fri-sun) or 3 nights (mon-thurs): 750 dlls. (14 guests or less, extra guest camping 25 dlls.). b.- Weekend, two nights (fri-sun) or 3 nights (mon-thurs): 950 dlls. all bedroom’s stuff (sheets, pillows and blankets included) and all essentials bathroom’s stuff (towel, soap). Bird and wildlife list and Topo maps. Bilingual field excursion guides with enough time of introduction of the ranch’s history, goals and current research and conservation activities………100 dlls per day. I run the website animaltourism.com, which guides people about where to go to see animals. After I ran a story on the jaguar photos at your ranch, Sergio Avila suggested I list you. Is the listing below correct? Would you let me interview you for a small article about your ranch and what people could do there? What animals can people see most reliably at your ranch? Can just regular people (as in, not scientists) stay at night? What are your rates? What was the ranch before? How did you become a conservation ranch? Have you ever seen the jaguar? With my respect, I apologize about my delay, but I’m here to answer all your questions, I hope it will be useful for you. Attached you will find a list of birds and protected animals we have at the ranch. The list below is an example with some mistakes but it comes from my experience at the ranch.